Reviews | Regal Dill Weed - 32 oz. Regal Dill Weed - 32 oz. Featuring a parsley-like flavor and a unique appearance, dried Regal dill weed adds a distinct taste to a wide variety of dishes! Green in color, these feather-like leaf flakes from the dill plant also resemble a mild version of caraway seed. The word dill is Norwegian in origin, meaning "to soothe." This herb's delicate leaves are used to add a light, refreshing flavor to salads, sauces, stews, and braises. Popular in parts of Russia and the Mediterranean, it suits many different types of cuisine. We use this daily for our pizzas and breadsticks, our customers love it and has good flavor. I love the price point on the bulk seasonings from Webstraunt Store. The Regal Dill Weed is a great product for a great price! The quality is excellent! We use it in ranch dressing, house-made pickled veggies, soups, and other savory dishes! GREAT! Tastes just like a Dill pickle, hence the name I guess. Love this spice. Has the right amount of heat to make your pickle flavorful but not too overpowering. You get a large amount for the price and if you use it well it goes a long way. Love All my products from WebstaurantStore! The quality and price of the Regal Dill Weed in Bulk can not be beat! Spices are always fresh! Color of the Dill is a bright health green. Not Dull. The Bulk containers keep the spices fresh and are easy to store. The regal dill weed is amazing and tastes just like the fresh dill from our garden. We love using dill in our potato salad and the quality is unbeatable. A nice flavor addition to any cuisine. I'm not sure why I'm writing a review of dill weed, but this is the best dried dill weed I've ever tasted. It is so fresh, so green, so pungent that we had to adjust our ranch dressing recipe to accommodate it. If you're worried about the quality, don't. Great stuff. As good as you will get anywhere else at a fraction of the price. Great dill weed and excellent pricing for the bulk jar. A nice herb to have on hand to make salad dressings and flavorful dipping sauces. Nice dried dill weed from Regal. Very good in our salad dressings. Really adds a nice depth of flavor and taste. Very clean and fresh. 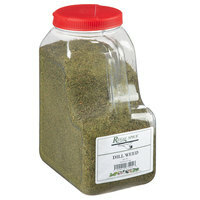 A great bulk container of dill weed that is great for making dips and adding dill to recipes. The large mouth on the jar makes it easy to scoop out. The product is a great quality. A nice quality dill weed that is herbal perfection. A great flavor tone that is great for adding to our pickle brine for great flavor. Excellent product!! we use quite a bit of dill in many of our recipes at our restaurant and i was very pleased to find it on here for such a great price. The dill weed is very strong and perfect for making our dill dip for vegetables. The dill weed is dried perfectly and is such a great quality and price. We use this to make our famous dill dip mix. Bright, green dill weed that looks just picked. The scent is heavenly and the flavor is full and robust. Excellent choice. Great fun making the traditional dill and sour cream dips. We also use in house made pickles. Quality is excellent and price point is great. Will come in real handy at canning time next year. For price and size is great. Had some beans and canned them now and they turned out great with flavor and freshness. Absolutely delicious in tzaziki. Mix it with plain yogurt, cucumbers, garlic and lemon juice. So yummy! It makes a great vegetable dip or cracker dip. A really nice fresh tasting dill weed that is great for dips and dressings. It always arrives fresh and they are really great quality for the price. This Regal dill weed is a great buy in this quantity. It is always fresh and has a great taste! i love having it in my pantry. lovely Dill Weed, one of my favorite spices!! i like to use dill mixed into cottage cheese (let sit in the fridge for several hours, so the flavor can 'develop'), in some soups, and in (red) potato dill salad. and a very nice price, here at webstaurantstore! We love the fresh and vibrant taste of dill weed. it adds a nice touch to our cucumber dill dressing and our customers love it. We searched for a bulk container that would take the place of chopping and drying our own. The result was so much better than we could have imagined. A highly recommend product!!! Looking to save a little bit of money buy in bulk. The container is resalable to hold the dill weed fresh and the opening is large to put a scoop in and refill a smaller container. Cheap and quick delivery. Good quality but not the BEST, this will meet your needs and to enhance the taste we mix this with fresh dill and does the job well. Great product! Dill arrived fresh, well-packaged and exactly as described. We are happy to order this product again, come time to restock. We recommend this product! This tub will last you a long time. Great price, good product. I like all of the spices in this line and I use them frequently. I had a vegetarian recipe which called for dill weed. I don't use it often but like to make sure I have it on hand. These prices are better than in most local stores. This dill will last forever for me. It is so good! I put it on everything but it's my favorite when making dressings with it. It is nice and fresh smells just like my fresh dill I had in my garden this year. The Dill Weed was delivered sooner than expected. It was surprisingly very fresh. Thought I'd try using it in my Dip Mixes because the price was very reasonable compared to what I usually pay. Will definitely buy again. great addition to fish and poultry or veggie dishes with avocado- adds good vitamins and antioxidents without affecting flavor much It has a mild taste not fragrant and potent like fresh dill but cooked or ground you can taste it well. I never seem to grow enough dill for my needs. I also teach fermenting classes, and we use a lot of dill in ferments. I will be buying these large containers all the time now. Thank you! An amazing seasoning for crabcakes or seafood dishes it came in very fresh and was at an affordable price I highly recommend you buy multiples. I had something happen when I ordered this item that has never happened before. Webstaurant actually shipped the wrong item and sent my thyme by accident. When i called they couldn't be nicer. I was told to keep the thyme and two days later, my dill was here. This is how customer service used to be. This company is a throwback to a better time! AMAZING CUSTOMER SERVICE!!! Quality fresh dill in a large container. I am impressed. It cost about 50% of what I had been paying from my supplier and came delivered to the door in 3 days. Thanks again Webstaurant. This is a great gill weed and the price is terrific! We use this on potatoes, in dips, and in an artichoke chicken dish. Love the taste!! This REGAL DILL WEED is delicious! We use this in a lemon and dill dip all the time and it is delicious! IT tastes like we picked it and dried it from our own garden! We fly through it! i use the dill weed almost in everything in our store, our dip test so good , i was worried when i made the order. but first thing i notice is the dill from smell i though i ordered fresh dill . Good spice at a great price. Fresh, flavorful and good to have during canning season as we use at lot of it in our pickle recipes. Just think about what 2lbs would cost you in a local store, get your spices from The Webstaurant Store. I was glad to find a larger quanity of dried dill at such a great price I use it in my house made ranch dressing as well as other dishes. It is our most pouplar dressing we use on our salad bar.